By the late 1940s, Old Spice for Men was hugely popular, so much so, that Shulton had opened a new plant in Clifton, New Jersey. The Hull Pottery Company was still supplying mugs and bottles, but the irregularities of the pottery bottle openings were causing production and leakage problems. Around 1948 Shulton sought the help of the Wheaton Glass Company in Millville, New Jersey, counting on the more uniform qualities of a molded glass product. 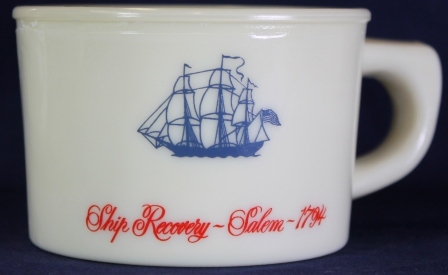 However, to maintain some brand identity consistent with the Early American theme, Wheaton set about producing a proprietary "pottery glass" formula. These mugs and bottles are similar to opal glass, but are manufactured in a clay color with a luster very close to pottery. Developing this glass required several months of research and several thousand dollars to determine the right blend of ceramic materials to give a realistic pottery appearance. The glass mugs have a small number on the bottom. This number is a mold or cavity indication used for quality control in the production process. The large group of glass mugs has been arbitrarily divided into "Early" and "Late" based on the shape of the mug. Early glass mugs are larger and have straight sides, closely resembling the original pottery design. They were sold from about 1948 until the mid 1950s. Late Glass mugs were a little shorter and are characterized by slightly tapering sides and a slight lip around the top rim. They were sold from the mid-1950s until 1992. The first glass mugs were introduced around 1948-1949. They resemble the smaller pottery mugs in all respects except for the glass and the markings on the bottom. The glass colors range from almost white to a creamy yellow. 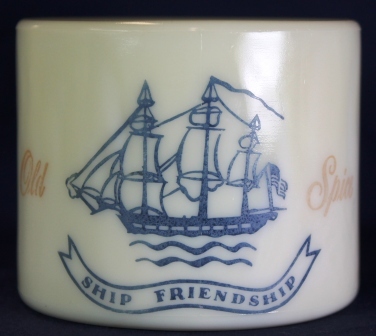 These mugs bore the "Ship Friendship." 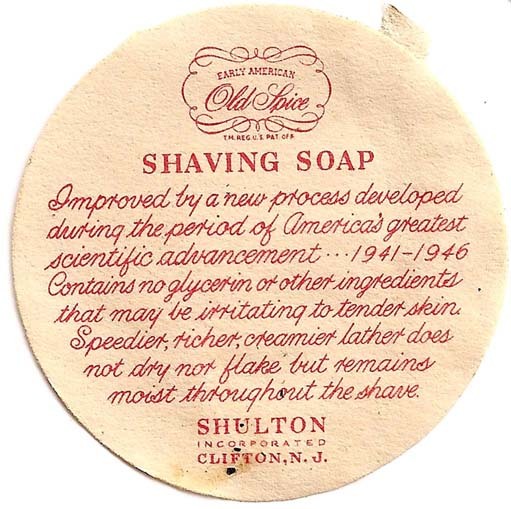 The bottom is marked "Early American Old Spice" in a top arc with "Shulton Inc., Clifton, N.J." in a bottom arc. The arcs are separated with a single star on each side. Early Glass Mug 02 is identical in all respects to Early Glass Mug 01 except for the inclusion of small ribs around the inside of the mug bottom to hold the soap in place! The first model had three ribs, followed rather quickly, I believe, by the six ribbed model. 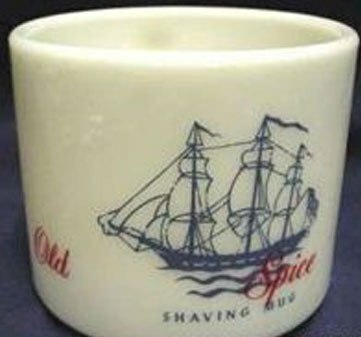 The ribs appear in all Old Spice shaving mugs that follow with the exception of the Blue Mug issued in 1985. This mug held a 5.0 ounce cake of shaving soap. Dimensions 2.75" high X 4.5" rim to handle. A paper label like the one shown at right; was attached to the bottom. This mug has the "new" logo shown more clearly bottom right. The original logo on top is characterized by the closed script "O" and "S". 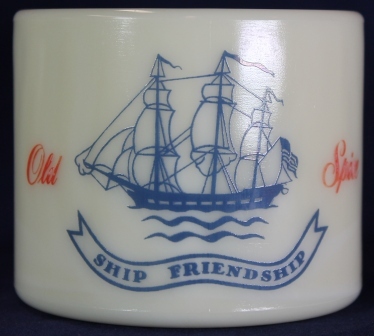 In the early 1950s this logo changed to an "O" with in inside loop and an open "S." The Ship Friendship is the same as Early Glass Mug 02. 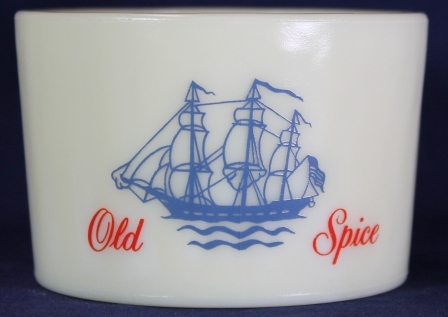 The bottom is marked "Early American Old Spice" in a top arc with "Shulton Inc., Clifton, N.J." in a bottom arc. The arcs are separated with a single star on each side. This mug held a 5.0 ounce cake of shaving soap. Dimensions 2.75" high X 4.5" rim to handle. 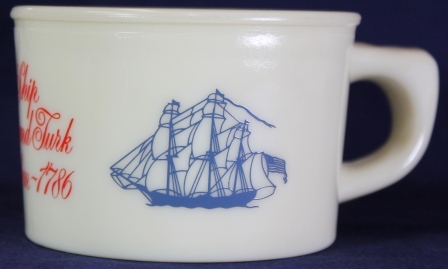 This mug was introduced in the mid to late 1950s, and is distinctive for two reasons: subtle changes to the graphic portrayal of the Ship Friendship and greatly improved graphics quality. Note that Mug 04 has a small pennant on the forward mast while Mug 03 does not. Also, the pennant on the main-mast of Mug 03 is much longer than on Mug 04. 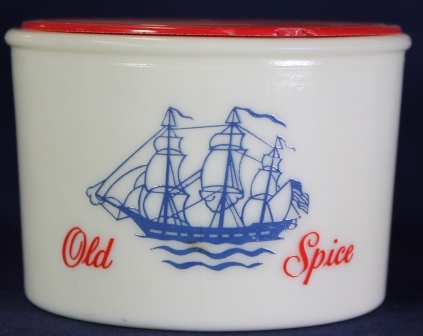 The bottom is marked "Early American Old Spice" in a top arc with "Shulton Inc., Clifton, N.J." in a bottom arc. The arcs are separated with a single star on each side. Dimensions 2.75" high X 4.5" rim to handle. This mug held a 5.0 ounce cake of shaving soap. 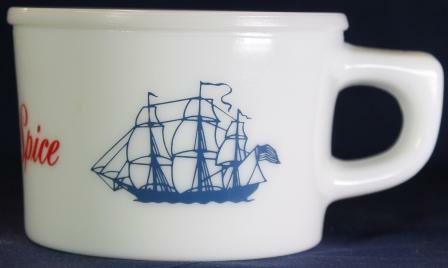 In this mug, produced in late 1950s to 1960, the words "Shaving Mug" were printed in blue beneath the image of the ship. The ship appears opposite the handle. 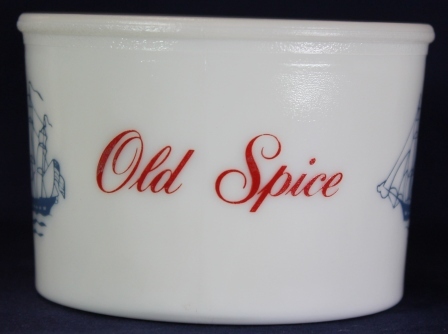 The bottom is marked "Early American Old Spice" in a top arc with "Shulton Inc., Clifton, N.J." in a bottom arc. The arcs are separated with a single star on each side. Here is an Early Mug 05 with a misaligned logo. These are very rare, a testament to the quality control used by Shulton and the Wheaton Glass Company. Dimensions 2.75" high X 4.5" rim to handle. This mug held a 5.0 ounce cake of shaving soap. This mug was sold from about 1961 until 1964. 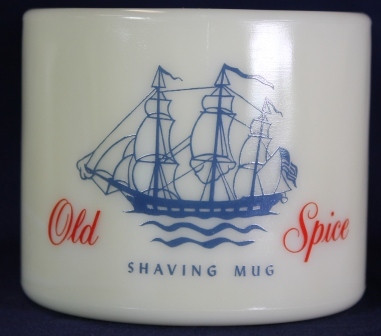 This is the first mug to have a slight taper to the sides and the words "shaving mug" were dropped. This is also the last mug produced before the introduction of a lip on the top outside edge (the Late Glass Mug series). Bottom is marked Old Spice and Shulton with a number that is the mold mark used by Wheaton Glass in the mug manufacturing. Dimensions 2.25" high X 4.5" rim to handle. This mug introduced a smaller cake of shaving soap at 4.0 ounces. 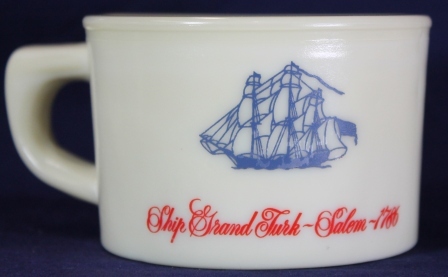 The graphics on this mug are identical to the Early Glass Mug 06, and the sides are tapered, but note the lip around the top rim. Dimensions 2.25" high X 4.5" rim to handle. This mug held a 4.0 ounce cake of soap. 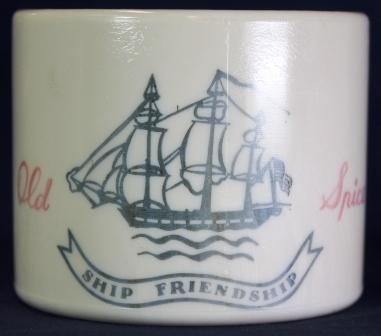 This one has the words "Old Spice" in red opposite the handle, and a ship (an unnamed Ship Friendship) on each side. This mug comes in cream color and a pure white. Bottom is marked Old Spice and Shulton with a number that is the mold mark used by Wheaton Glass in the mug manufacturing. Dimensions 2.25" high X 4.75" rim to handle. This mug held 4.0 ounces of shaving soap. This mug is a variant of Late Glass 01. Note that the ship is slightly different - the pennant is curled above the mainsail and there are no waves beneath the ship. The script "Old Spice" is also a bit bolder. The bottom markings do not indicate a foreign country of origin. This may cause a little confusion with the Belgium Mug 01 to which it is identical but is marked "Made in Belgium." Dimensions 2.25" high X 4.75" rim to handle. This mug held 4.0 ounces of shaving soap. 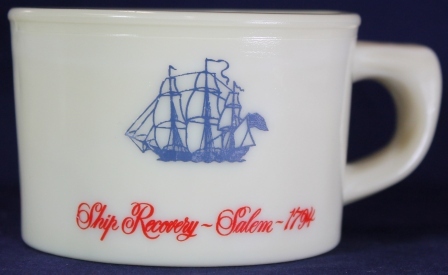 This mug was sold from 1964 until 1978. 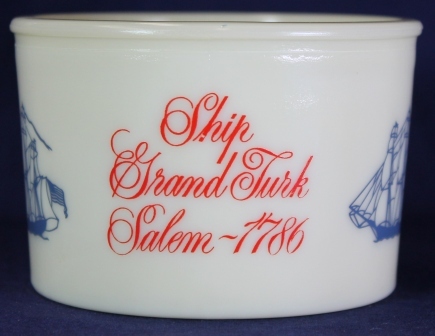 The ship name appears opposite the handle, with Ship Grand Turk on each side. Bottom is marked Old Spice and Shulton with a number that is the mold mark used by Wheaton Glass in the mug manufacturing. Dimensions 2.25" high X 4.75" rim to handle. This mug introduced a reduced shaving soap cake of 3.75 ounces. 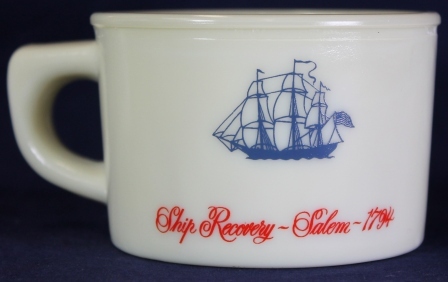 Late Glass Mug 03 shows the Ship Recovery on both sides. I believe it was manufactured for a few years starting in 1978. Bottom is marked Old Spice and Shulton with a number that is the mold mark used by Wheaton Glass in the mug manufacturing. Dimensions 2.25" h X 4.75" rim to handle. This mug held 3.75 ounces of shaving soap. This glass mug was introduced around mid 1970 and I believe it to be the last mug produced. 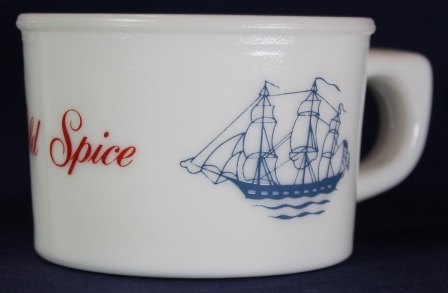 It has two ship images on opposite sides of the mug. One is Ship Grand Turk - Salem 1786 and the other is Ship Recovery - Salem 1794. 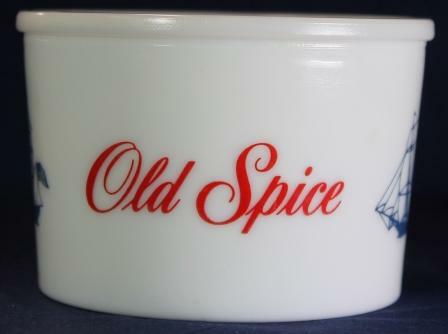 The bottom is marked Old Spice and Shulton with a number that is the mold mark used by Wheaton Glass in the mug manufacturing. Dimensions 2.25" h X 4.75" rim to handle. This mug held the smallest sized cake of shaving soap at 3.0 ounces.